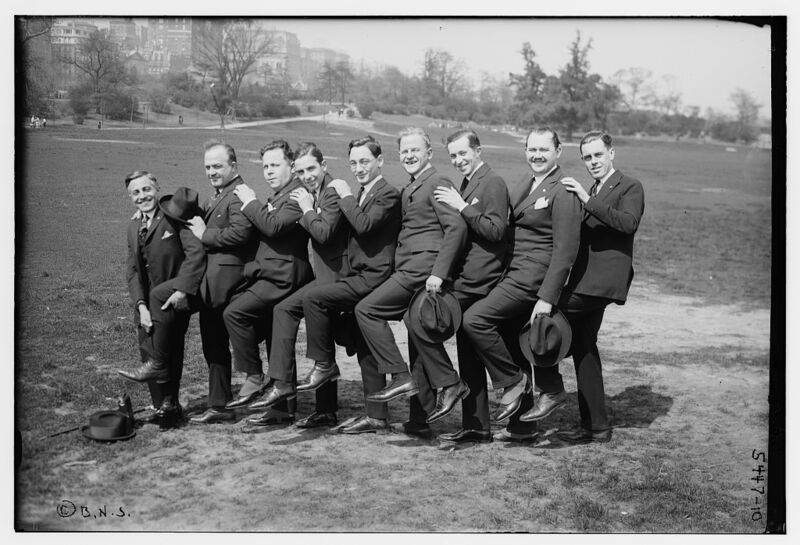 2nd from right is Paul Whiteman. en.wikipedia.org/wiki/Paul_Whiteman "Paul Samuel Whiteman (March 28, 1890 – December 29, 1967) was an American bandleader, composer, orchestral director, and violinist. As the leader of one of the most popular dance bands in the United States during the 1920s and early 1930s, Whiteman produced recordings that were immensely successful, and press notices often referred to him as the "King of Jazz"." www.discogs.com/artist/341395-Paul-Whiteman-And-His-Orche... indicates that his band was recording with Victor in 1921. See also adp.library.ucsb.edu/index.php/talent/detail/30033/Paul_W... commons.wikimedia.org/wiki/File:Whitemanband1921.jpg shows the group with what could be the same personnel. www.youtube.com/watch?v=oFAorRpMTzg has a long note about the group. [https://www.flickr.com/photos/[email protected]/] thank you for info! Thanks, swanq, we can add info to records.